The diagnostic research pipeline is “leaky” with major gaps, so cross-agency coordination is essential. Policymakers can help by raising awareness of diagnostic errors as a priority topic, sparking cross-agency coordination, and infusing additional research funding for solving this critical public health problem. This should include exploration of public-private partnerships (e.g., aligning efforts of private foundations in diagnostic research; identifying strategic partners within private industry willing and able to co-fund research and/or disseminate novel diagnostic technologies or best practices; and working closely with private safety and quality organizations to benchmark and improve performance). There are major gaps in the diagnostic research pipeline. The NIH structure is poorly suited to fund most diagnostic research, because of its organ system and disease orientation (which is perfectly suited to treatment-related research). This is because the diagnostic process is often about differentiating disease A from disease B – if diseases A and B “belong” to two different NIH institutes, then studying that diagnostic process is aligned with neither institute’s mission. As a result, there is a major funding gap in the early aspects of the translational research pipeline carrying new diagnostic discoveries forward. As a result, few diagnostic tests or approaches are ever directly studied for their impact on patient health, and many never reach clinical practice. For treatments, this gap is typically filled by industry-sponsored phase III clinical trials, but only rarely is this the case for diagnostic tests and devices. This is largely because pharmaceuticals are subjected to a more rigorous standard than diagnostics prior to FDA approval and use. Those marketing pharmaceutical treatments must demonstrate health benefits for patients in randomized trials; as a result, there is industry incentive to conduct such trials. By contrast, those marketing diagnostic tests or devices must only demonstrate that they measure what they claim to measure and that they are safe—there is no requirement that they benefit patient health. As a result, from the industry perspective, conducting studies to determine the health benefits of a diagnostic strategy is a risky proposition with little hope of meaningful return on investment. Accordingly, it is essential that the federal government play a key role in closing this gap. Raising Awareness (SIDM/CID) – SIDM and the Coalition will lead efforts to raise public and policymaker awareness of the problem of diagnostic error by creating opportunities for Congress and other health policy stakeholders to hear from affected constituents, research scientists, and private organizations who want to solve it (e.g., Mont Fund, Gordon & Betty Moore Foundation). Cross-Agency Coordination (AHRQ) – As requested by Congress in the Committee Report accompanying the FY18 Senate Labor, Health and Human Services, and Education Appropriations bill, AHRQ should "convene a cross-agency working group that will propose a strategy to enhance scientific research to improve diagnosis in healthcare, as outlined in the 2015 NAM report." 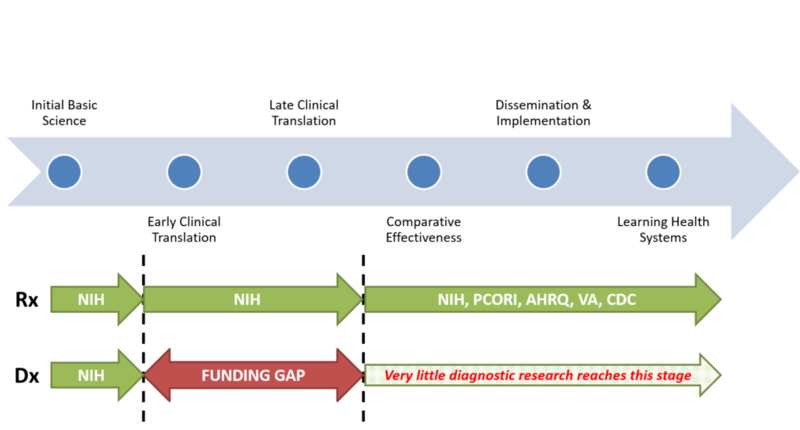 Funding (Congress) – Congress should immediately appropriate new funds to AHRQ to overcome key barriers, as outlined above, by (a) establishing Research Centers of Diagnostic Excellence, (b) creating training opportunities through Diagnostic Fellowships, and (c) validating and deploying key operational measures of diagnostic quality & safety that matter to patients. We envision a one-time appropriation ($10 million/year for five years) to fund at least five national centers to spark research, train researchers, and develop measures that enable and drive improvement. Simultaneously, Congress should provide sufficient resources for AHRQ to carry out the cross-agency coordination functions described above. We envision an additional $1.5 million to support short-term planning and convening activities. In FY19, Congress should enact an ambitious ACT to Improve Diagnosis initiative to fund the cross-agency strategy developed through AHRQ’s leadership at a level commensurate with the public health magnitude of the diagnostic error problem ($100 million/year for ten years). CATALOG recent past and current research related to diagnostic safety and quality. SOLICIT information from other agencies on work they may be doing in this arena. OUTLINE a tactical plan to coordinate a cross-agency task force on diagnostic research. CONVENE federal research funding agencies (e.g., AHRQ, NIH, PCORI, VA, CDC) and a broad range of other stakeholders, including patient advocates, outside the federal government. ANALYZE key gaps in research to improve diagnosis as identified by healthcare stakeholders, with an emphasis on clarifying needs across the diagnostic research continuum. RECOMMEND a multi-agency strategy that links specific agencies to particular aspects of research to improve diagnosis (e.g., implementing Centers of Diagnostic Excellence or research training programs might be priorities for AHRQ; developing a novel biomarker for sepsis might be a priority for NIH; studying closed-loop test results reporting might be a priority for the VA; and conducting large, pragmatic trials comparing current care to novel diagnostic strategies such as remote expert tele-diagnosis could be a priority for PCORI). DEPLOY requests for proposals designed to address critical gaps (e.g., measurement), while maintaining a focus on funding implementation and application of diagnostic approaches that deliver improved patient outcomes and greater healthcare value. CATALYZE and coordinate cross-agency diagnostic research efforts as part of an ACT to Improve Diagnosis initiative designed to eliminate preventable harms from misdiagnosis. MONITOR progress and adjust these strategic plans as needed as the field evolves.